In 9th century, Buddhism was in decline in trans-himalayan region due to persecution from Bon Tibetan rulers like Langdarma of Guge (A.D. 836 to 842). 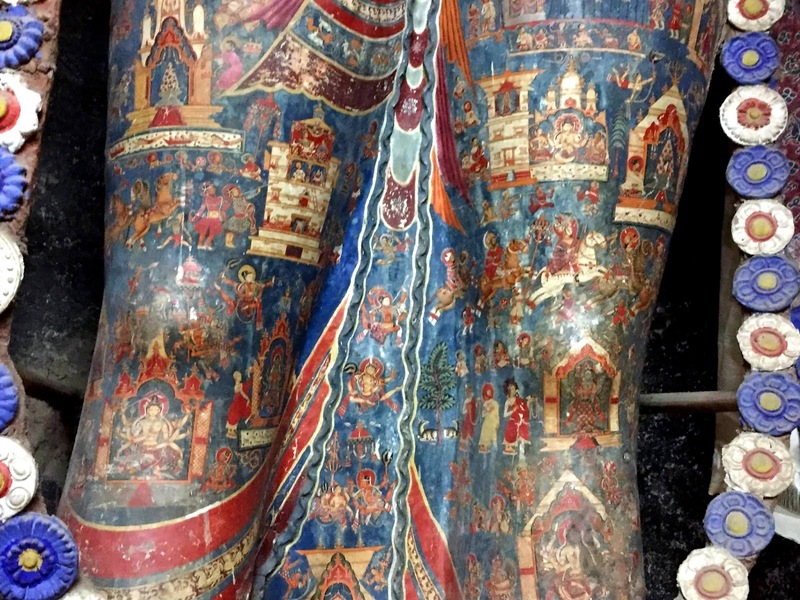 The faith was in decline until King Yeshe-Ö (A.D. 947-1024) came to the throne of the kingdom that consisted of the present Indian territories of Ladakh, Spiti and Kinnaur, and Guge and Purang in western Tibet. To revive the faith, Yeshe-Ö sent 21 young men to viharas of Kashmir and other parts of India where Buddhism was still flourishing. They were to study and translate the texts of Mahayana Buddhism and bring them to west Tibet. Of these 21 men, only two survived the journey and returned home. One of them was Rinchen Zangpo who in 10th century is credited to have built over 100 monasteries all over Himalayan region from Ladakh to Sikkim. Of these building few survive, the best and the most famous remains Alchi about 10,500 feet above sea level in Ladakh, by the side of Indus. At the entrance of Alchi a contemporary painting representing Lochen Rinchen Zangpo (958–1055) . He is said to have founded the Alchi monastery by planting a pipal tree here. Lochen means 'the great translator'. Rinchen Zangpo was a student of Buddhist Bengali master named Atiśa (Born 980, Bikrampur, Bengal, Pala Empire (now in Bangladesh)). Zangpo is said to have spent quite sometime studying in Kashmir. His biography mentions that for building Alchi and other monasteries, Zangpo brought 32 artists from Kashmir. Thus, laying foundation for one of the oldest and the most unique monasteries of Ladakh. 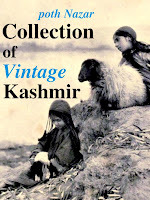 It is here, you can see scenes from ancient Kashmir - 900 year old glimpses left by those Kashmiri hands. Kalhana was to offer us such glimpses only some time later in 12th century. The best place to visualize his Rajatarangini is at Alchi rendered in a style mixing Indian, Kashmiri, Tibetan and central Asian artistic traditions. 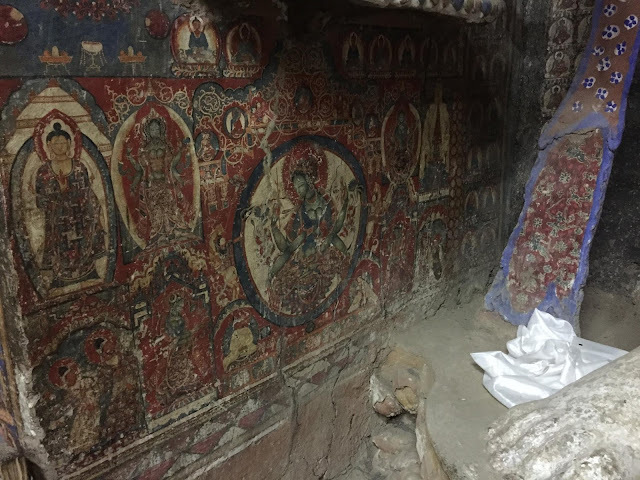 The Kashmiri painters at Alchi have drawn these scenes around bodhisattva Avalokiteśvara in Sumtseg temple of Alchi. Avalokiteśvara, 'the lord who looks down', the buddha of compassion, is said to live on mythical mountain Potalaka which modern scholars say is in fact Pothigai hills of Western Ghats (Tamil Nadu/Kerala). It is now run by Likir Monastery, currently headed by the Dalai Lama’s younger brother, Tenzin Choegyal. Although Ladakhi tradition places the monastery in 10th century and to Zangpo, inscriptions at the temple ascribe the monastery to a Tibetan noble called Kal-dan Shes-rab later in the 11th century. The various temples here are now dated to be between early 12th and early 13th centuries. A period of great religious and political upheaval for the entire region with the coming of Ghaznavid Attacks on the sub-continent, but miraculously, owning to its geographic location, left this place untouched. Alchi temples are also the oldest surviving big wooden structures done by Kashmiris. If you are a woman, there is a chance he will grab your hand and try to explain away the place. 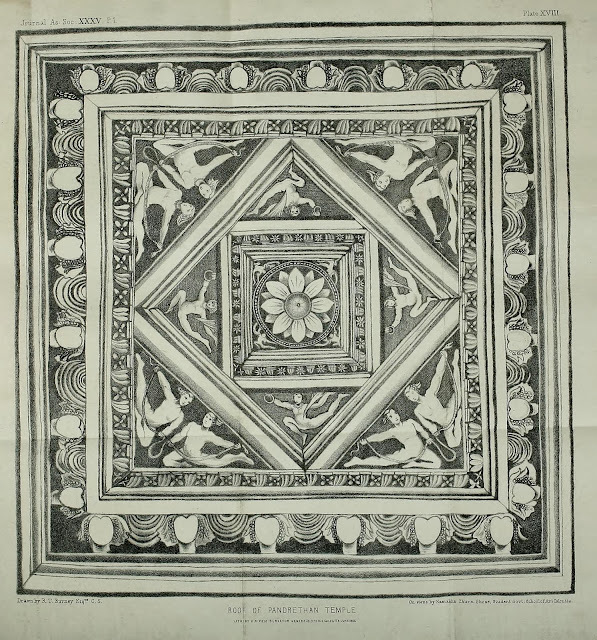 making it the only surviving sample of Kashmiri cloth design of medieval times. Scholars like British anthropologist David Snellgrove and German art historian Roger Goepper have suggested that the scenes depict ancient pilgrimage sites of Kashmir or famous sites of Kashmir known to the artists (depicts 13 places in all and a place). It is a map of Kashmir. The figures in the painting look too Kashmiri, with typical nose, beards and half-closed eyes. But the over-all feel seems a bit Islamic. Not just Trans-Himalayan and Indian subcontinent, 10th, 11th and 12 century Kashmir was also going through some major changes. The Hindu Shahi Kings in Kabul were going to rise and then fall under Ghaznavid blade. Kashmir of Lalitaditya Muktapid ( 724- 761 A. D.) when Hinduism and Buddhism flourished together in Kashmir was past but its legacy in form of architecture was still alive (One of the oldest Kashmir text from the era, 'Nilamata Purana', mentions Buddha was one of the lords worthy of worship). Queen Didda (979-1005 AD), grand-daughter of Bhimadeva, Shahi ruler of Kabul, arrived to rule Kashmir. Shivaie Abhinavgupta wrote the great work of Kashmir Shaivism, Tantrāloka. Mahmud Gaznavi couldn't get Kashmir due to its remoteness. For the moment valley was safe from outsiders. But, wasn't safe from insiders. Kashmir was to see the reign of Harsha (ruled 1089-1111 AD), a destroyer of Hindu and Buddhist temples. He had many ancient temples destroyed, had their golden statues melted for financial reasons. In fact, for his temple destroying ways, Kalhana calls Harsha a 'Turushkas'. Apart his temple destroying ways, Kalhana (whose father was a minister for Harsha) in his Rajatarangini also remembers the King as a patron of arts and music. It is mentioned that under his rule new fashions of dress and ornaments from foreign were introduced. His ministers were always luxuriously dressed. In his army were employed Turk soldiers (foreign Muslims, in Rajatarangini any Muslim from Central Asia was a 'Turk'). Can these be the riders seen in the paintings at Sumtsek? 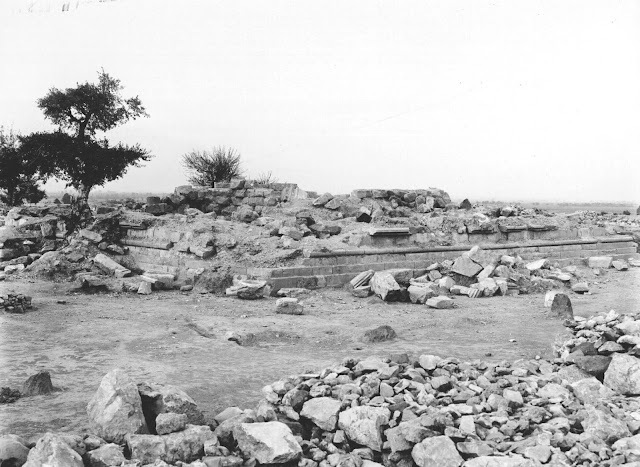 Rajatarangini, mentions that the scale of Harsha's temple destruction was immense, but some temples did survive. Among those saved was one at Parihaspora, left untouched as a favor to a singer named Kanaka. The year was 1097. Parihaspora was the capital of Lalitaditya. Here he had built five large buildings viz.,(1) the temple of Mukta-keshva with a golden image of Vishnu, (2) the temple of Parihasa-keshava with a silver image of Vishnu. (3) the temple of Mahavaraha with its image of Vishnu clad in golden armour, (4) the temple of Govardhanadhara with a silver image and (5) Rajavihara with a large quadrangle having a large copper Buddha. At the site, was also a stupa built by Chankuna, Tokharian minister of Lalitaditya. The site has earlier been plundered by S'amkaravarman (A.D. 883-902), son of Avantivarman. But, obviously some of it must have survived. The silver image of Vishnu Parihasa-keshava was carried away and broken up by King Harsha. Rajavihara was not touched. The site was finally destroyed by Sikandar But-Shikan (A.D. 1394-1416). 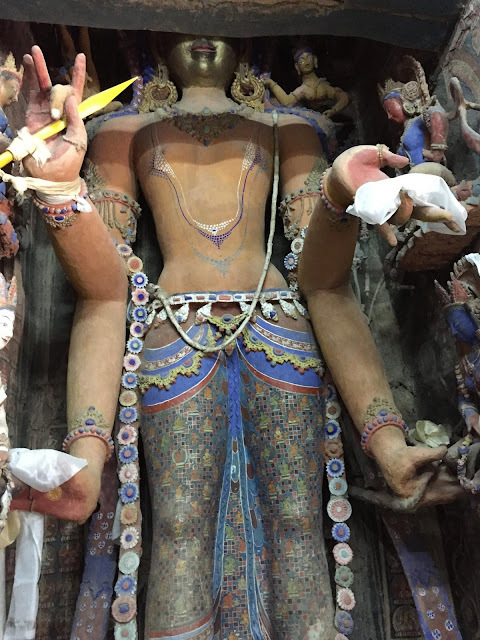 However, even up to the year 1727 A.D. the Paraspur plateau showed architectural fragments of great size, which were carried away as building materials. The scholars now suggest that these Buddhist sites of Parihaspora can be seen depicted in the paintings on the west niche of Sumtsek temple. west niche of Sumtsek temple. Outside the temple, there are some monk cells meant for meditation. The inside of the monk cells tell another interesting tale. 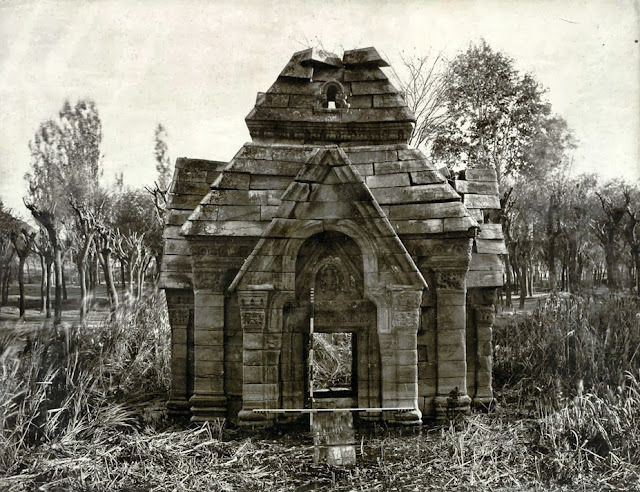 Photograph of the Meruvardhanaswami temple at Pandrethan near Srinagar, taken in 1868 by John Burke. 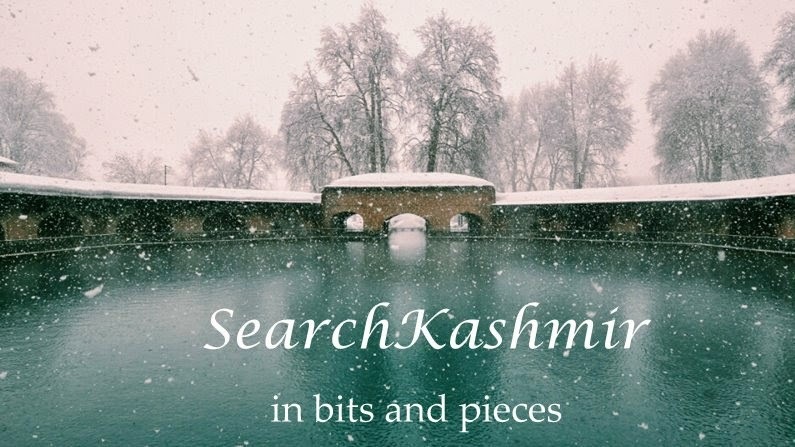 Pandrethan, now mostly in ruins, is one of Kashmir's historic capitals, said by Kalhana in his poetical account of Kashmiri history called Rajatarangini to have been founded by king Pravarsena in the 6th century AD. By 13th century, the Buddhist Kashmiri Pandits in Ilkhanate court where heading back to Kashmir as Iran became Islamic. But, by the end of 14th century, Kashmir also became Islamic. The famous Bodh vihara of Nalanda in Bihar was destroyed by Muhammad Khilji. It's last head a Kashmiri named Shakyashri Bhadra (1127­-1225) headed for Tibet and then retired to Kashmir. Later Rajataranginis tell us that temples with beautifully painted walls were found in Kashmir till Akbar arrived in 16th century. The area around Hari Parbat in Srinagar was full of such temples. But, these got lost or destroyed and none remain. Around 16th century Alchi monastery was abandoned for unknown reasons. The stories on its walls remained etched and untouched for centuries. A little time capsule, storing the glory of ancient Kashmir and its artists.